"Such a high percentage of sulfur is unusual and this is what leads some folks to consider the volcanic origin (at the Martian bedrock). There are some minerals that have been identified in the infrared that would suggest the presence of water since they form in water. In particular, if this is a volcanic terrain that we are looking at, the presence of these minerals might suggest this was a hydrothermal area and sulfur is a component of such environments." 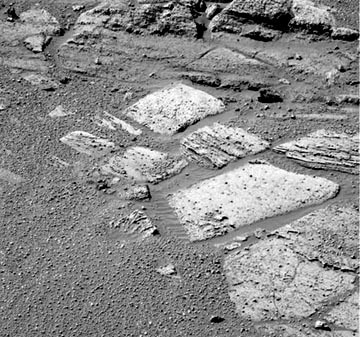 Above: Opportunity Rover is now moving along bedrock after discovering a large percentage of sulfur in the rocks. Image courtesy: NASA/JPL/Cornell. 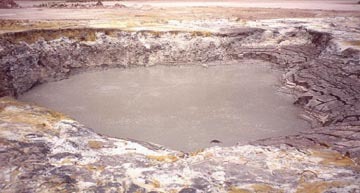 Below: Could the Martian Meridiani Planum have once looked liked the boiling hot volcanic spring below?